rediff.com: cricket channel - When Sachin met Schumacher! Roll mouse over thumbnails for the bigger image. The world's best batsman and Formula One's champion had a rare meeting at Silverstone, on the eve of the British Grand Prix, recently. 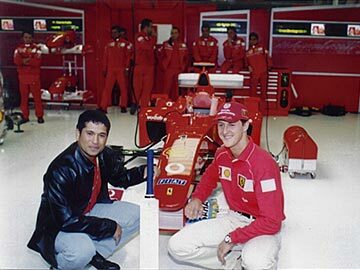 On the occasion, Schumacher presented the 'little genius' the keys to a Ferrari 360 Modena. Tendulkar was presented the Ferrari by Fiat, for his feat of equalling Sir Donald Bradman's tally of 29 Test centuries. (c) 2001 rediff.com India Limited. All Rights Reserved.